BinderHub uses Helm Charts to set up the applications we’ll use in our Binder deployment. If you’re curious about what Helm Charts are and how they’re used here, see the Zero to JupyterHub guide. Below we’ll cover how to configure your Helm Chart, and how to create your BinderHub deployment. To configure the Helm Chart we’ll need to generate several pieces of information and insert them into yaml files. Now we’ll collect the information we need to deploy our BinderHub. The first is the content of the JSON file created when we set up the container registry. For more information on getting a registry password, see Set up the container registry. We’ll copy/paste the contents of this file in the steps below. This command is run twice because we need two different tokens. apiToken: "<output of FIRST `openssl rand -hex 32` command>"
secretToken: "<output of SECOND `openssl rand -hex 32` command>"
Next, we’ll configure this file to connect with our registry. The content you put just after password: | must all line up at the same tab level. Don’t forget the | after the password: label. <docker-id> and <password> are your credentials to login to Docker Hub. If you use an organization to store your Docker images, this account must be a member of it. Create a file called config.yaml and choose the following directions based on the registry you are using. <google-project-id> can be found in the JSON file that you pasted above. It is the text that is in the project_id field. This is the project ID, which may be different from the project name. <prefix> can be any string, and will be prepended to image names. We recommend something descriptive such as binder-dev- or binder-prod- (ending with a - is useful). Note that in both cases, you should remove the < and > symbols, they are simply placeholders in the code above. ``<docker-id OR organization-name>`` is where you want to store Docker images. This can be your Docker ID account or an organization that your account belongs to. ``<prefix>`` can be any string, and will be prepended to image names. We recommend something descriptive such as binder-dev- or binder-prod- (ending with a - is useful). This creates a docker config.json used to check for images in the registry and push builds to it. If you setup your own local registry using native basic HTTP authentication (htpasswd), you can set token_url to None. auth_config_url: "https://index.docker.io/v1" # must match above! however, BinderHub is aware of DockerHub’s peculiarities and can handle these without any additional configuration beyond registry.url. This command will install the Helm chart released on March 3rd, 2019 as identified by the commit hash (the random string after 0.2.0-), which is provided as a working example. You should provide the commit hash for the most recent release, which can be found here. --version refers to the version of the BinderHub Helm Chart. Available versions can be found here. name and namespace may be different, but we recommend using the same name and namespace to avoid confusion. We recommend something descriptive and short, such as binder. If you run kubectl get pod --namespace=<namespace-from-above> you may notice the binder pod in CrashLoopBackoff. This is expected, and will be resolved in the next section. This installation step will deploy both a BinderHub and a JupyterHub, but they are not yet set up to communicate with each other. We’ll fix this in the next step. Wait a few moments before moving on as the resources may take a few minutes to be set up. For the first deployment of your BinderHub, the commit hash parsed to the --version argument should be the same as in step 3.4. However, when it comes to updating your BinderHub, you can parse the commit hash of a newer chart version. If the helm upgrade command above succeeds, it’s time to try out your BinderHub deployment. Note the IP address in EXTERNAL-IP. This is your BinderHub IP address. Type this IP address in your browser and a BinderHub should be waiting there for you. You now have a functioning BinderHub at the above IP address. Increasing the GitHub API limit is not strictly required, but is recommended before sharing your BinderHub URL with users. By default GitHub only lets you make 60 requests each hour. 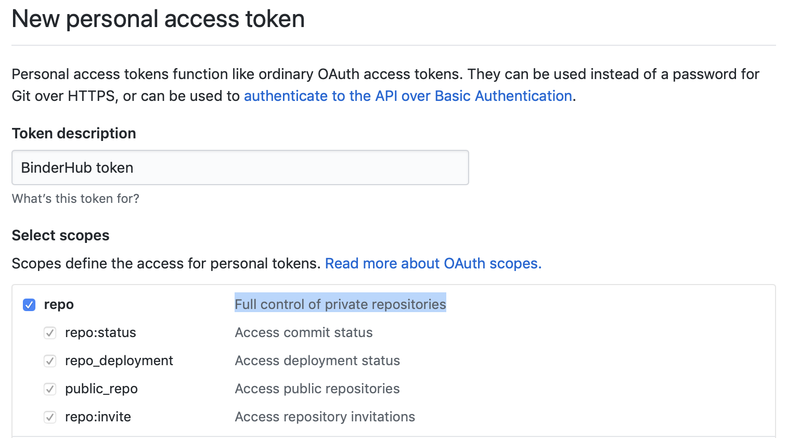 If you expect your users to serve repositories hosted on GitHub, we recommend creating an API access token to raise your API limit to 5000 requests an hour. Create a new token with default (check no boxes) permissions here. This value will be loaded into GITHUB_ACCESS_TOKEN environment variable and BinderHub will automatically use the token stored in this variable when making API requests to GitHub. See the GitHub authentication documentation for more information about API limits. For next steps, see Debugging BinderHub and Tear down your Binder deployment. By default, BinderHub doesn’t have access to private repositories (repositories that require credentials to clone). Since users never enter credentials into BinderHub, BinderHub itself must be given permission to clone any private repositories you want BinderHub to be able to build. Since cloning is done ‘as binderhub’ this means that any user can build any private repository that BinderHub has access to. They may be private from the wider world, but they are not private from other users with access to the same BinderHub. Granting permission follows the the same steps above in Increase your GitHub API limit to create a GitHub access token and configure BinderHub to use it. Previously, the token only needed minimal read-only permissions (the default). In order to access private repositories, the token must have full read/write permissions on all your repos . Creating a token with the full repo scope needed in order to clone private repos. You can set these permissions when you create the token, or change them after the fact by editing the token’s permissions at any time at the token administration page. Hopefully in the future, GitHub will allow more granular permissions for private repos. 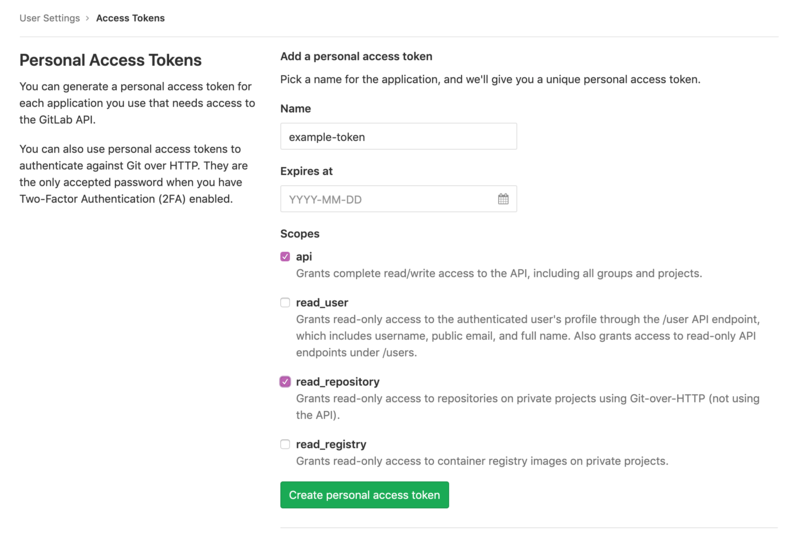 To access private GitLab repos, create an API token for your binderhub user under “User Settings” > “Access tokens”. It at least needs the scopes “api” and “read_repository”. This token will be used for accessing the GitLab API, and is also used as the git password when cloning repos. With this token, no username is required to clone a repo.